Christmas wreath / Christmas platypus / Unconditional! I've been up to so much since I last done a week in photos post, I've been so darn busy. Probably the most exciting thing is that I received an unconditonal offer from Heriot Watt! 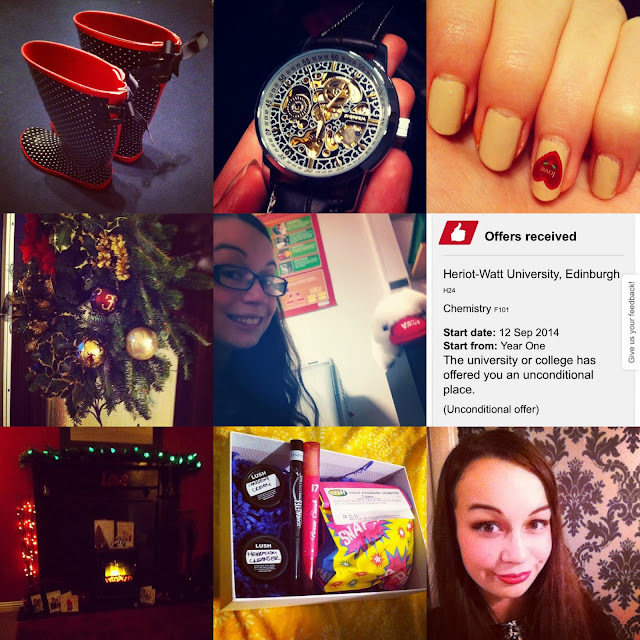 I put my UCAS applications in on Sunday morning and heard back from Heriot Watt on Tuesday night. Edinburgh will still be my first choice but as Heriot Watt was my second choice, I'm really happy! My #bbloggerssecretsanta came on Thursday so a big thank you to Tamsyn because my present was so lovely. I have a blog post scheduled for Tuesday with some more info about that. I'm also working on a new blog design with my home girl Jess. She's making me a new header and I'm working the rest of my design myself this time. I'm going for something a little bit more minimalistic and clean. You may have noticed my new social media buttons(but you probably didn't) which I done myself. The media buttons were from Pixel Frau and I used to tutorial from Sew Many Ways to install them. It was so easy. I'm hoping that by this time next week my whole design will have changed. Oh! And I also bought my own domain so you're now on www.waterpainteddreams.com, how fancy?